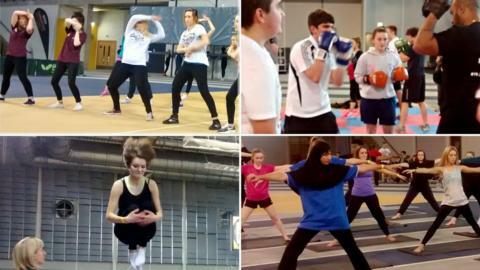 About 450 Scottish school pupils aged 16-18 are taking part in a BBC Get Inspired Active Academy at Dundee International Sports Centre. The aim is to promote healthy living, whether it is by joining a local team, exercising at home, or getting into 'lifestyle' sports like free-running or parkour. Various activities will be on offer, from netball and rugby to archery and rock-climbing. And there was a the live Q&A webcast with three sports stars hosted by Sanjeev Kohli that you can re-live here. Commonwealth Games gold medallist swimmer Robbie Renwick, Olympian snowboarder Lesley McKenna and pro freestyle BMX rider Keelan Phillips were in the hot seat, answering questions from the audience and online. Stalls hosted by Snowsport Scotland, Volunteer Scotland, Abertay University and The Corner will be on hand to offer advice and information. Pupils will also be able to watch demonstrations from the professionals on BMX tricks and (snow-free) snow-boarding tricks. This schools event is a partnership with Leisure and Culture Dundee, and pupils are coming from Aberdeenshire, Dundee, Fife, Glasgow, Perthshire and West Lothian. BBC Get Inspired aims to encourage people to get involved and get active.